We recognise that even small Data Centres of a few server cabinets handling low sensitivity information still require an appropriate locking system. 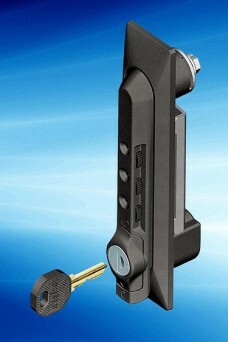 The 1155 program combination swinghandle is one such solution for data/co-location centres, but also for hardware protection such as bike lockers at universities or other establishments. The 1155 swinghandle features a conventional round cylinder lock keyed all the same or different as required – this is used in conjunction with a three digit combination lock. The handle may be released using the key only – which also permits the three dial combination to be set. Once set the handle may be released by use of the combination alone – thus the key/pin priority is established for blocks of cabinets with a hierarchy of control. The IP65 rating also ensures suitability in arduous industrial situations such as banks of control cabinets in a factory environment. The 1155 uses industry standard cut-outs so is a simple retro-fit to upgrade existing equipment with single point or multi-point rod lock installations. Share the post "Combination Swinghandle for Data Centre Security"